This week has been all about demolition. 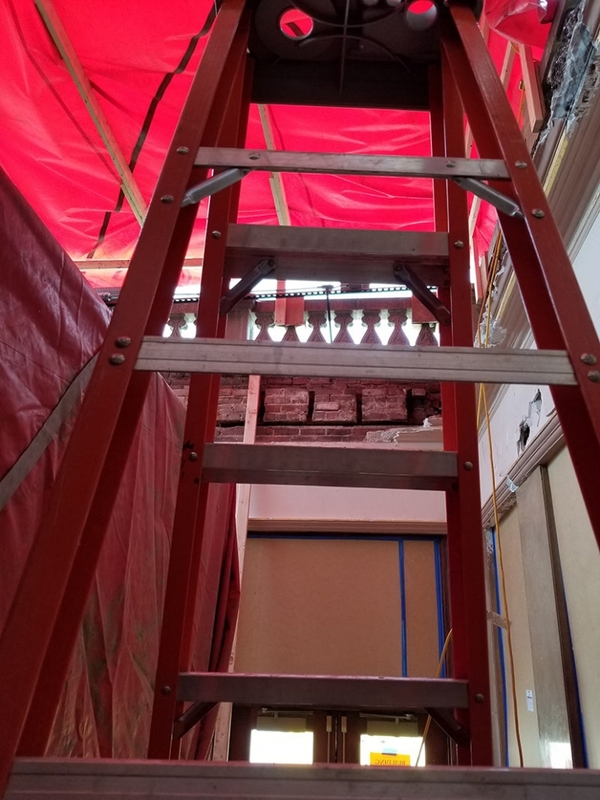 It’s happening quickly, and it’s all very exciting, as the “out-of-the-way” spaces that are being fully renovated are prepared to be revitalized and the historical spaces are being prepped carefully for restoration. It’s all designed to set the stage for the next 30 years and beyond of great Sheldon programming! There is a lot of exposed steel infrastructure, as things are opened up reveal new possibilities. 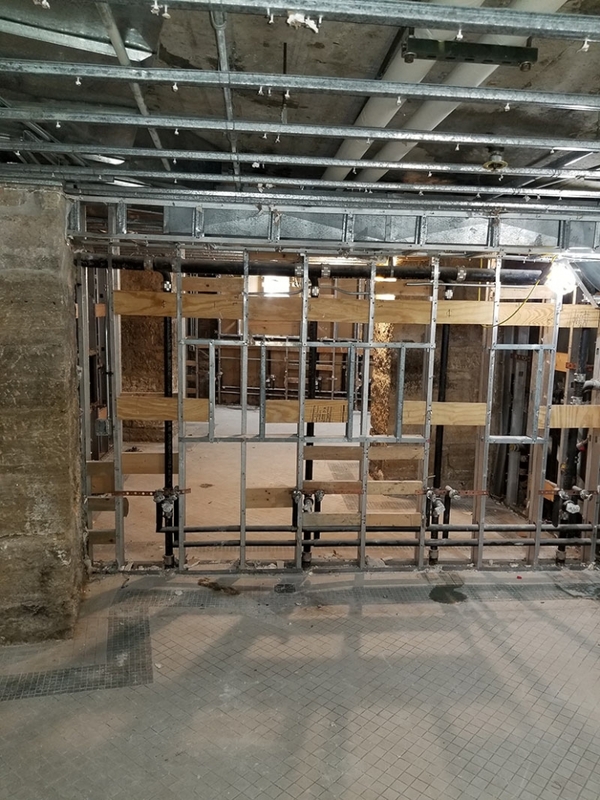 On the basement level underneath the stage, it’s stripped down to beams and concrete, where the new green room will soon be. 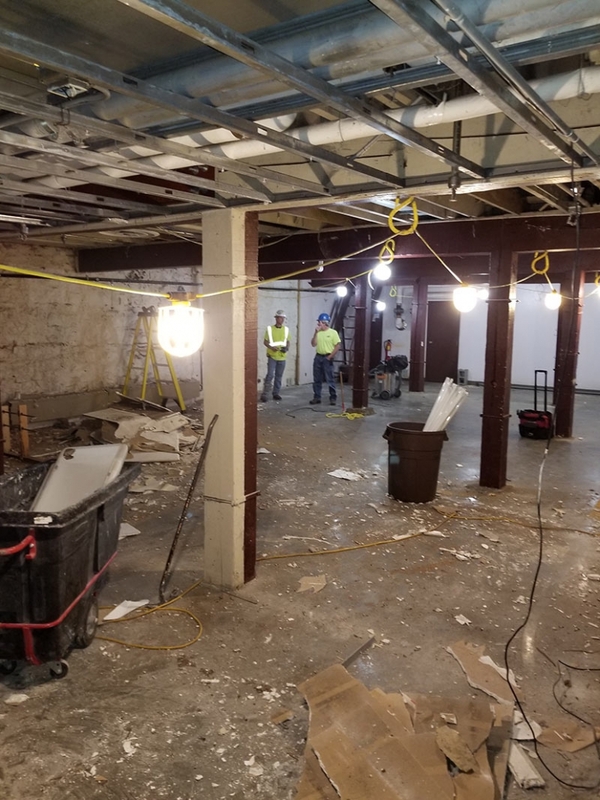 Also on the lower level, the 1980s public restrooms have been fully gutted, making way for what will be all new Men’s and Women’s ADA compliant restrooms plus a single stall, accessible Family restroom. 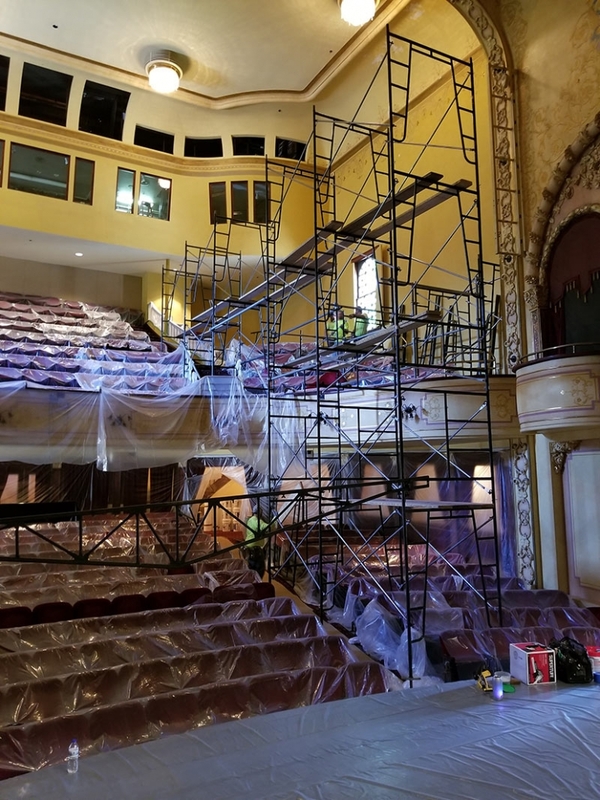 On the main level in the main house, seats are covered, and sunlight is streaming in through the windows as workers spend the next 7 – 10 days building scaffolding that will allow every painted surface to be cared for. 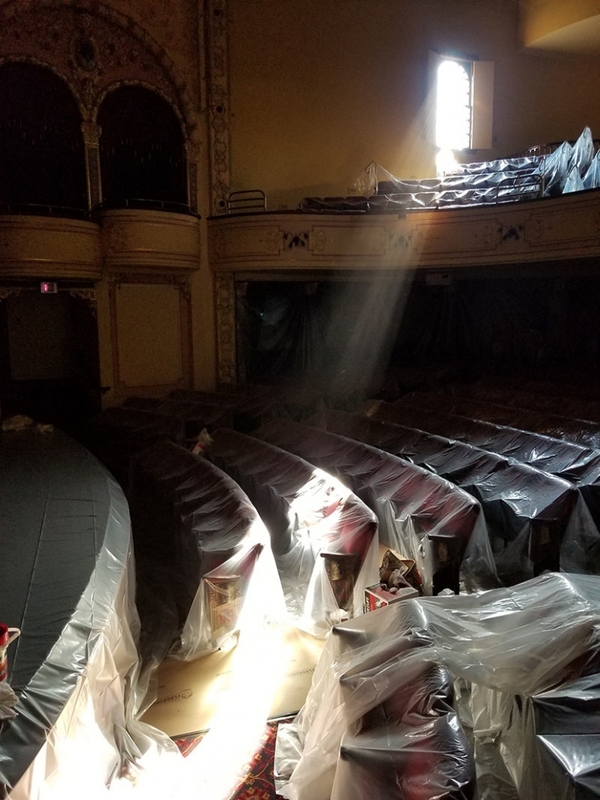 Such dramatic natural lighting is surely a good sign for a theatre! At the main entrance, the roof is gone entirely. Look up, and you get an unexpected view of the architectural detail that surrounds this lovely entrance to the building. 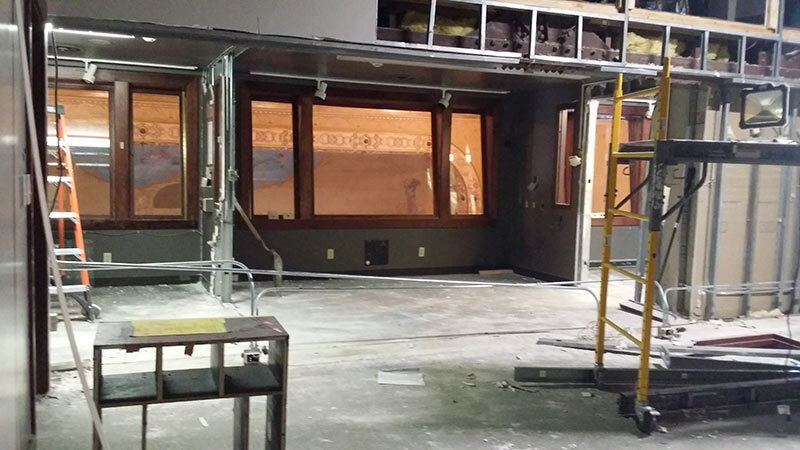 On the third floor, walls have come down to reveal the view that the rehearsal studio and event space will have from what was originally the second balcony and then the film projection booth and most recently a small conference room and lighting control booth. Stay tuned for many more updates here and on our social media channels.